Beautiful, elegant drop earrings with black rose on surgical steel posts an tear drop shaped Swarvoski crystals. A romantic symbol of love eternal, the black rose studs have surgical steel posts. 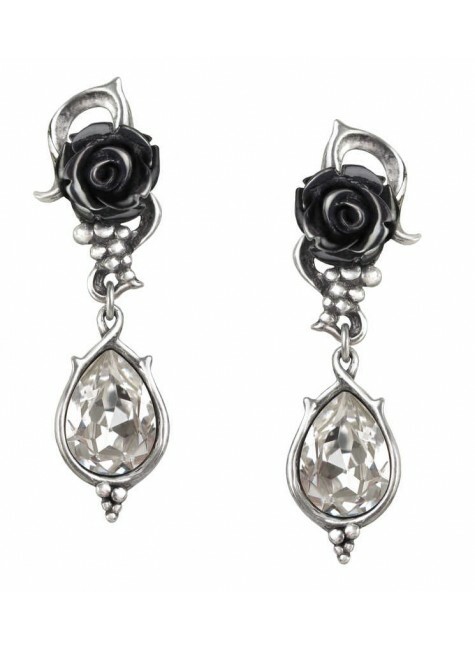 Made in fine English pewter, they have a sparkling tear drop shaped Swarvoski crystals. About 2 inches long overall. Item Number: AG-E347 | Approximate Size (Inches): 0.51 wide x 0.83 deep x 2.01 high | Approximate Shipping Weight: 0.25 lbs. Hampton Court Palace, built in 1514 by Thomas Wolsey, Roman Catholic car.. This beautiful, black pewter rose pendant represents romance, the mystery o..